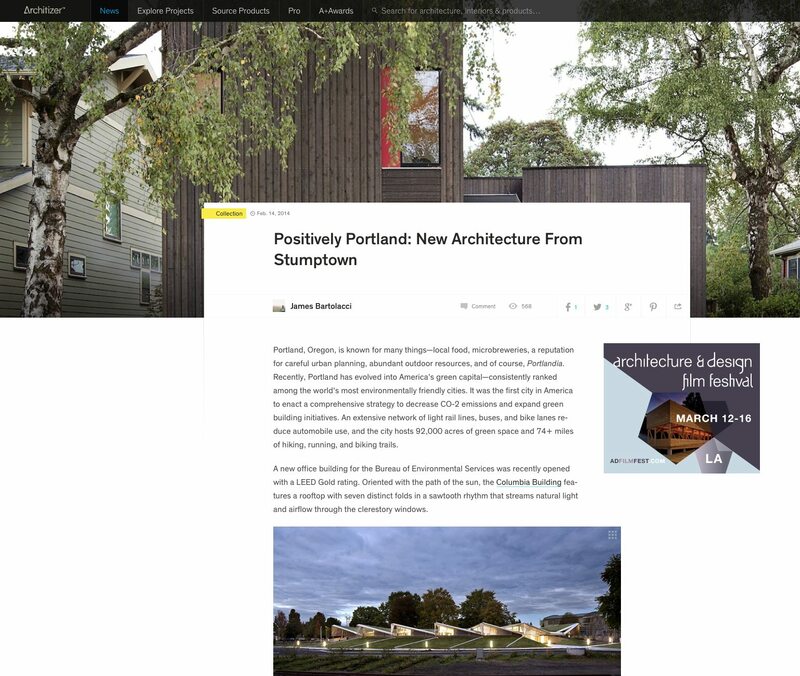 POLITICO has published an article by Sara Solovitch on the status of passivhaus in Portland, and some of the disagreements between Passive House Institute US (PHIUS) and Passive House Institute (PHI). 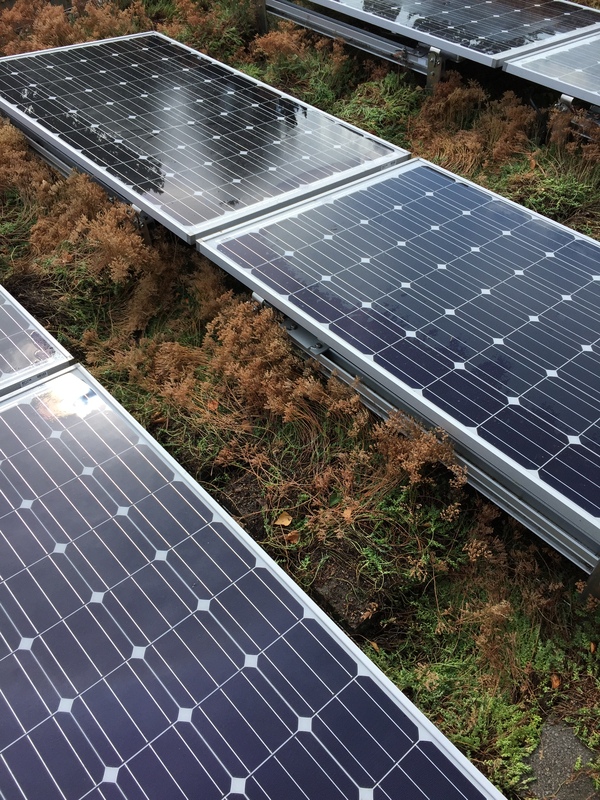 i received an email a couple of weeks ago alerting us that our PV array was generating less energy than typical, and that the system should be inspected. 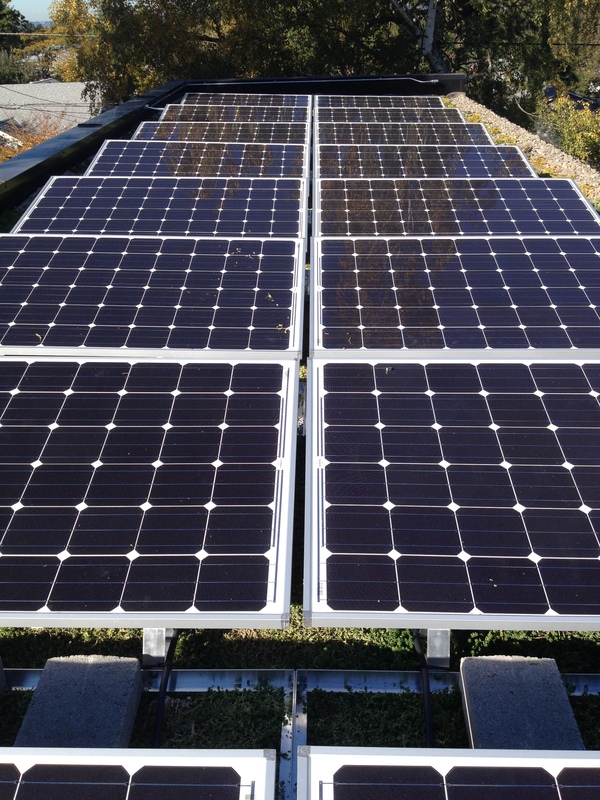 this is one of the benefits of leasing a PV system. 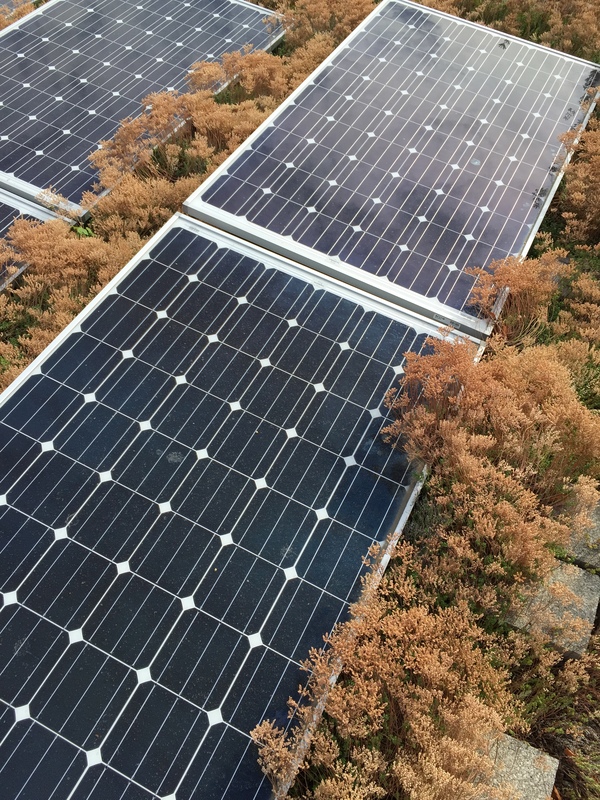 after a quick climb to the upper roof the problem was obvious – the sedum from the green roof had grown up and over the base of most of the panels. 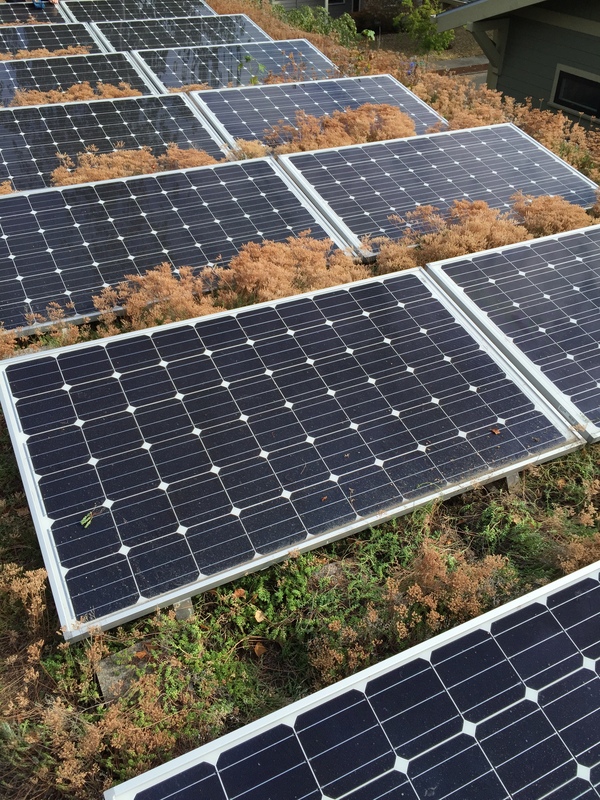 while in hindsight it may have been better to mount the panels higher above the roof, in less than 30 minutes the sedum was cleared off and away from the panels and they were washed clean. later this fall i will prune back the sedum and again check in on the array. it’s interesting to compare our actual annual consumption to the predicted consumption per the PHPP model. 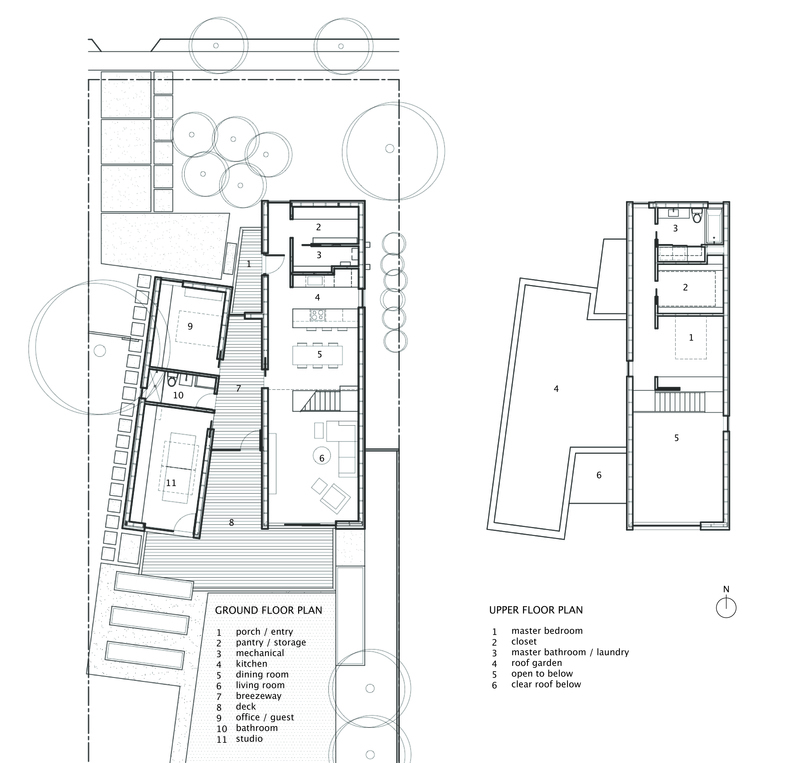 this project was modeled in PHPP 2007, and there has been some criticism in the passive house community suggesting that the German default values for electrical consumption built into PHPP are far too low for the US culture. (PHIUS has gone so far as to radically change the default values for electrical consumption). given the data on our project, i’m not so sure there is a problem. occupant behavior of course plays a significant role in energy consumption, and there are a number of conditions to note for this building. PHPP assumes 4 occupants for a house of this size, when in reality there are only 2 of us (plus 1 dog and 2 cats) which should result in lower overall energy consumption. with fewer occupants, there will be lower internal gains which presumably would increase slightly the heating demand and heat load. Because we both work from home much of the week with computers and other devices running all day, it could be assumed that while there are only 2 of us, our consumption includes both home and work and would therefore be higher. I also should note (somewhat sheepishly) that we have 3 cables boxes that stay on all the time, including one DVR, which draw a steady amount of electricity and generate some heat. 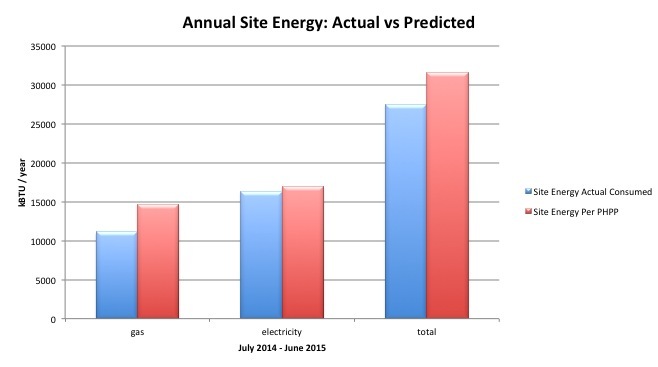 This is all somewhat anecdotal, but it shows the inherent complexity in accurately predicting energy consumption. 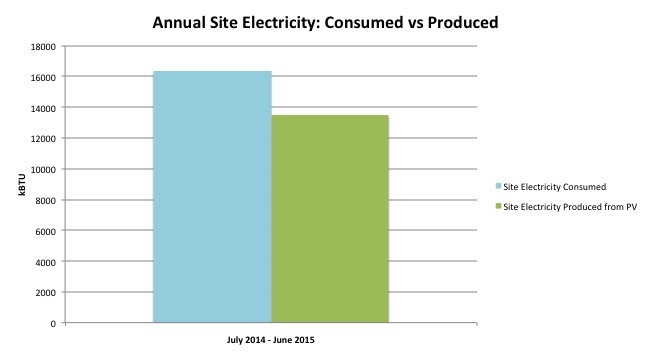 an annual summary of our site electricity consumption and site energy production (from our roof mounted 4.32 kW array) shows that we generated 82% of the electricity we consumed. 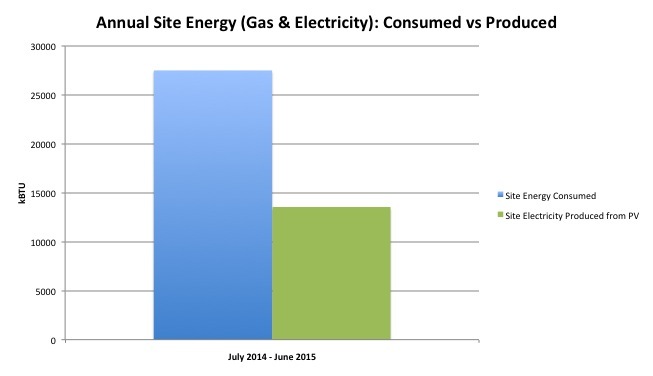 an annual summary of our site energy consumption (gas and electric) and site energy production shows that we generated 49% of the total energy we consumed. 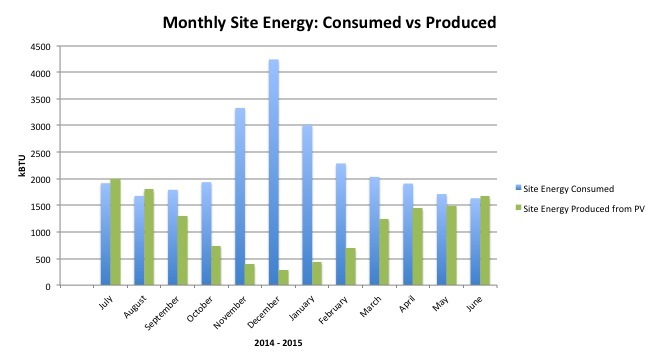 a monthly summary of our site energy consumption (gas and electric) and site energy production (from our roof mounted 4.32 kW array) shows the large deficit during the winter months as expected. more efficient equipment for our space heat and hot water would certainly help to offset some of this deficit. 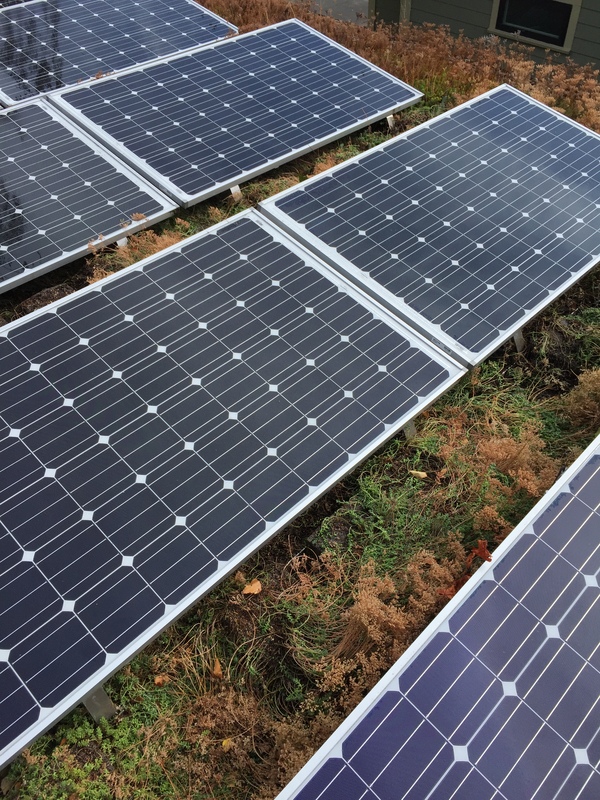 while a larger PV array would get us closer to net zero on an annual basis, it wouldn’t solve this deficit and demonstrates one of the problems with an approach that focuses solely on annual net zero energy. elrond burrell has written an excellent blog post covering this topic. 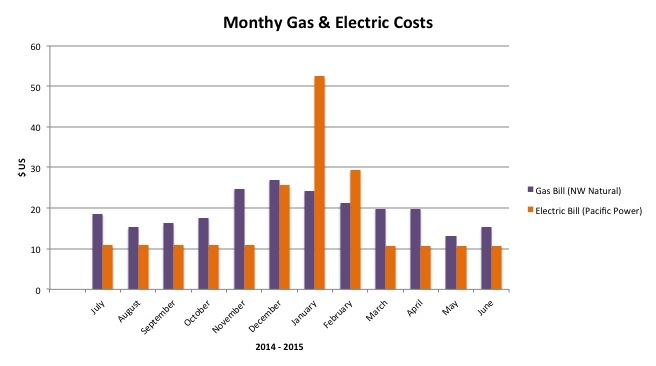 a monthly summary of our annual gas and electric bills demonstrates our consistently low monthly utility costs. our average monthly cost for both gas and electricity over the last year was $36.53. note that for most of the year we pay our electricity provider the minimum monthly charge even though we are generating more electricity than we are using. our only gas appliance is our hot water heater, and a significant portion of our small monthly gas bill is for fees and taxes regardless of our consumption. if we were to change our gas water heater to electric even without a change in energy consumption, our monthly utility cost would be even lower by eliminating the minimum gas charges. aside from reducing our CO2 emissions and our consistently tiny utility bills, we’re staying extremely comfortable year round – warm in the winter while barely using our heating system, and cool in the summer without any air conditioning. so the answer is unequivocally yes, it is definitely working. 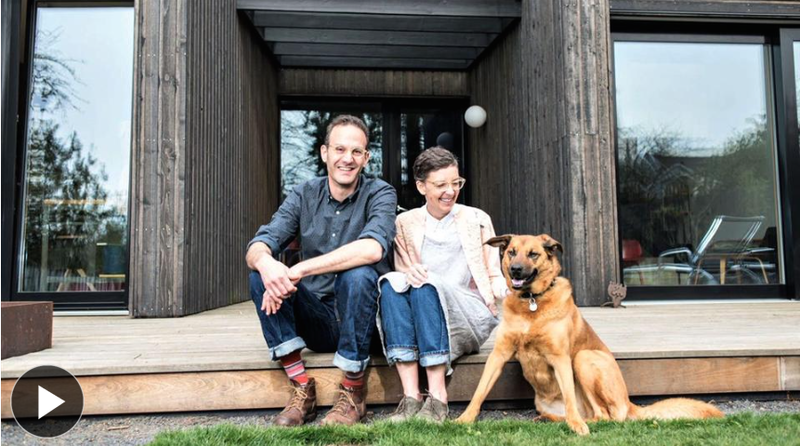 skidmore passivhaus was recently featured in the wall street journal. it’s international passive house days in case you didn’t know. 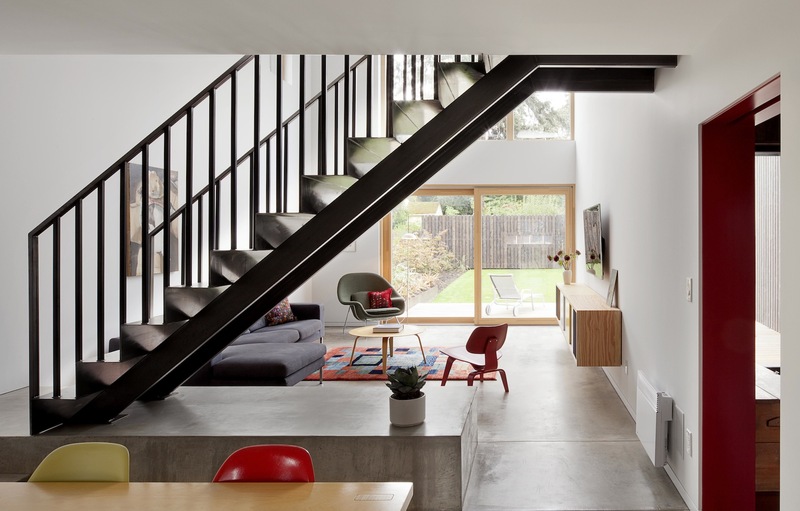 passive house projects around the globe are open to the public. we just wrapped up our open house and it was very well attended. thanks to everyone who came by. we hope you were inspired in one way or another. 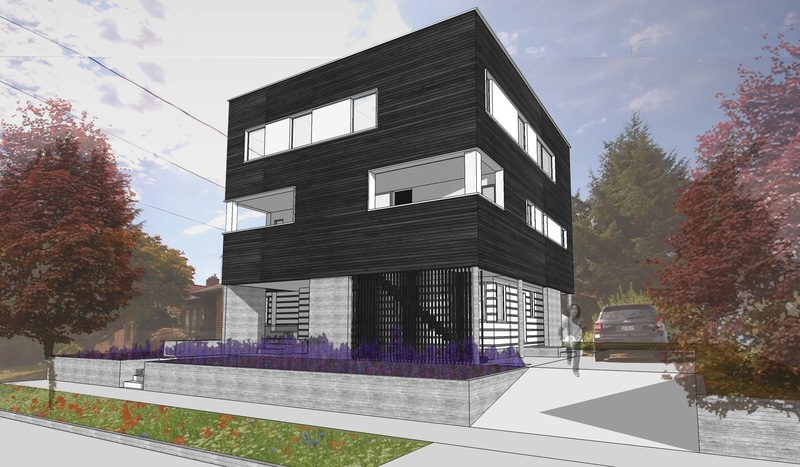 still time to see some of the other passive house projects in town. While there are many variables at play that make each project distinct, it is clear that form factor has a huge impact. Remember boxy can be beautiful! 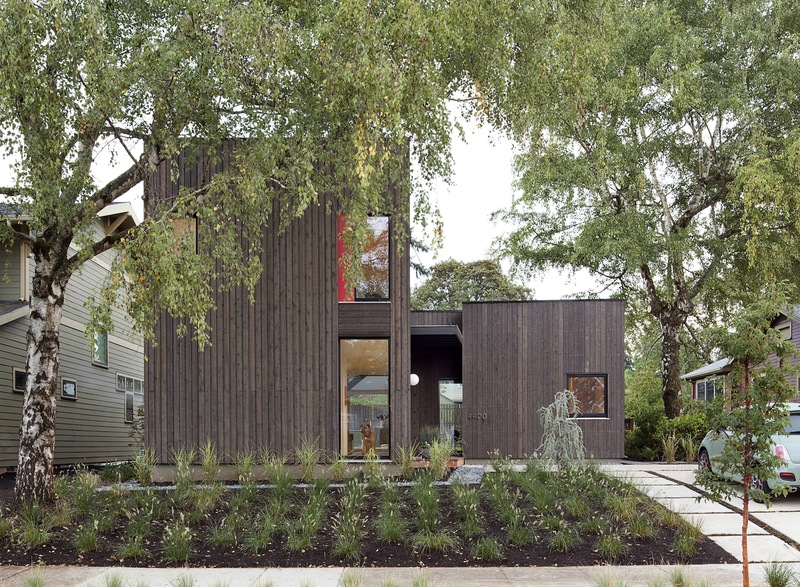 skidmore passivhaus was recently featured on houzz. 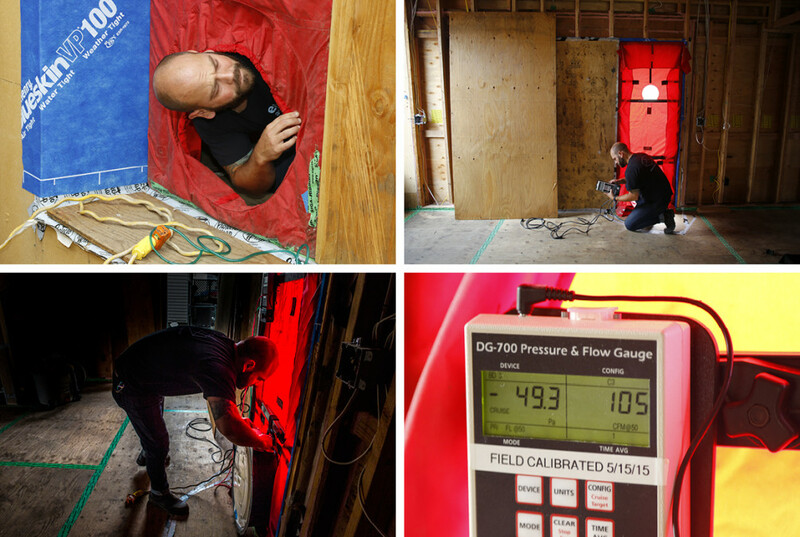 with an extremely low heating load, a passivhaus makes most typical residential heating systems unnecessary and unsuitable in terms of size and cost (this includes gas forced air furnace, ground source heat pump, and hydronic radiant heating). 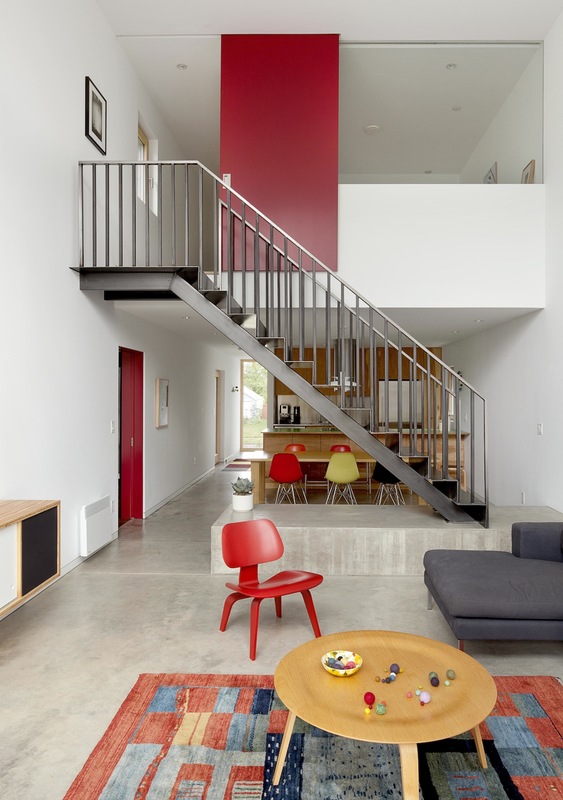 for skidmore passivhaus (1965 sf house /1680 sf treated floor area), the peak heating load per PHPP was estimated to be 5,657 btu/hr (at a design temperature of 32deg F). as an example, a small wood stove might produce about 20-30,000 btu/hr when running hot, far too much from a single point source in a passivhaus. in addition, providing fresh air for combustion and sealing all the penetrations creates complications, plus we frequently have no burn restrictions during our coldest winter days. a very small gas furnace still produces about 30,000 btu/hr, and delivers warm air at a higher velocity than is really comfortable. 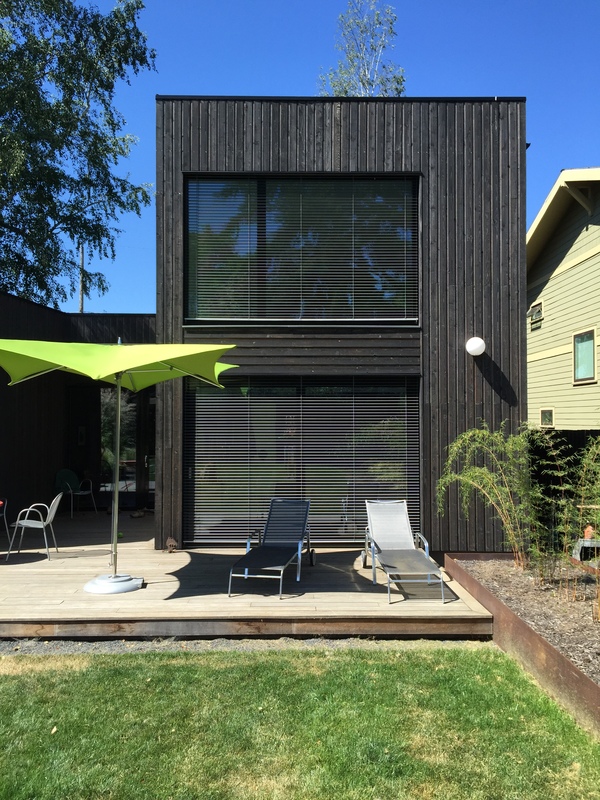 both systems could easily overheat a small passivhaus and each have their pros and cons. while gas here is still cheap and the electric grid nationwide is pretty dirty, most of our electricity in the northwest is generated by hydro and is clean and generally considered renewable. 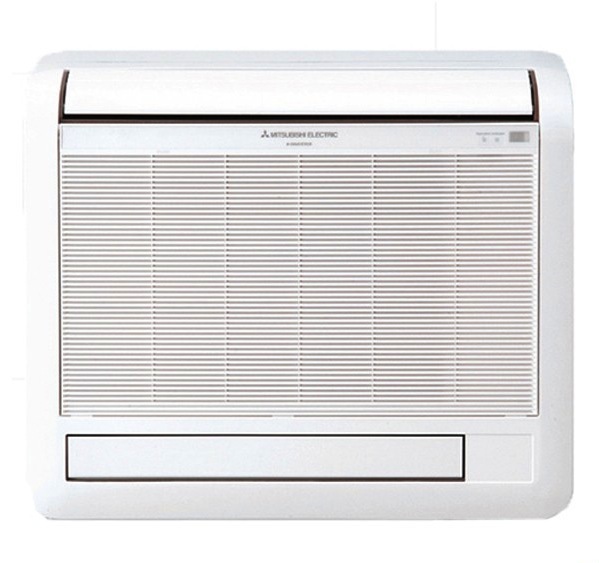 at skidmore passivhaus we elected to use electric resistance wall mounted heaters. in our climate mechanical cooling seems like an unnecessary and wasteful luxury, and we frankly did not want it at all. instead we opted for operable exterior shades on the large south facing windows to significantly reduce summer heat gain. 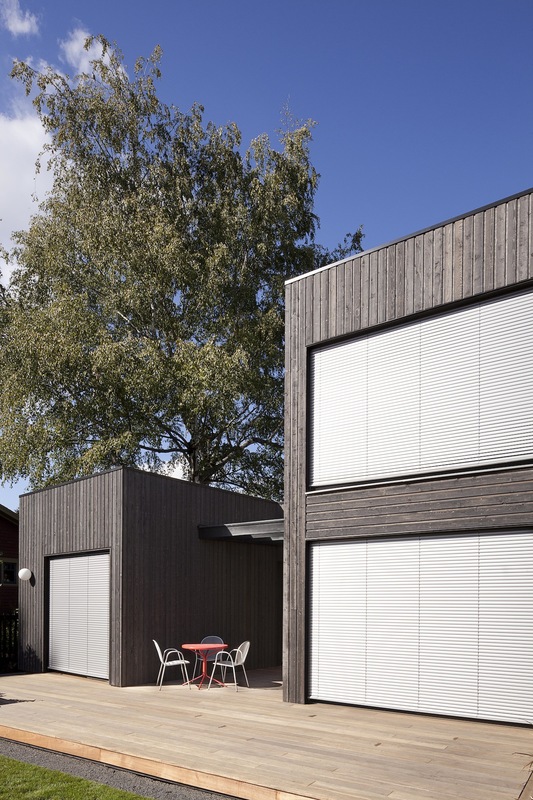 combined with well placed operable windows + doors and a nice amount of exposed thermal mass, the house stays extremely comfortable even during the hottest days of the summer. 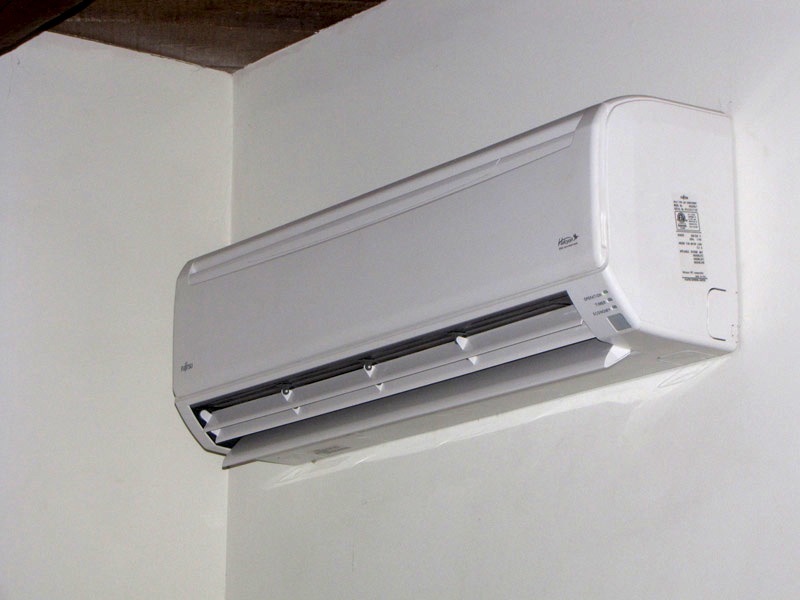 although the improved efficiency of a heat pump was (and still is) extremely appealing, we struggled with the significant additional cost, the appearance of the ductless heads, and the difficulty in zoning. for the money saved installing the electric resistance heaters (we spent under $1k total) we were able to install a decent sized roof mounted solar PV array. had we not built to passivhaus, we would not have considered this approach. 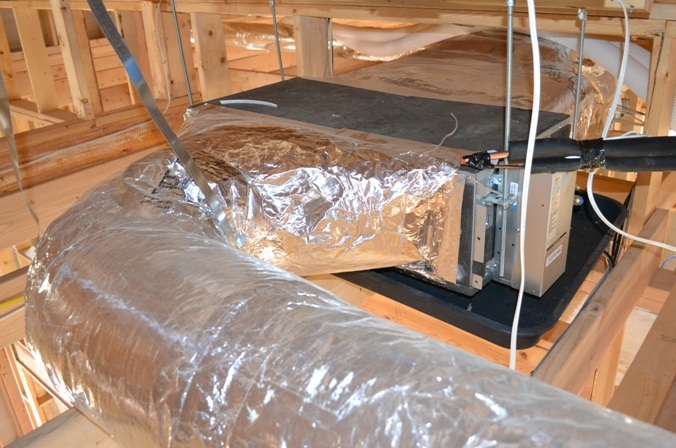 we installed a total of 4 individual convection heaters made by Convectair ranging from 1250 watts – 1750 watts each. these convection heaters don’t have a fan so they are completely silent. while there is an option to connect the heaters and control them from a single programmable thermostat, we opted to keep them individually controlled for maximum flexibility. without the programmable thermostat we have to adjust each heater daily, but this has simply become part of our routine and works for us because of our unpredictable schedules. because the plan is organized essentially as a one bedroom house with a separate wing with individual work spaces, an electric heater in each work space allows for simple control as separate zones. the open living room has one heater, while the remaining heater is in the master bedroom upstairs. because the house is so tight and well insulated, a number of rooms don’t have any heating source yet remain perfectly comfortable including the pantry, ‘breezeway’, main floor bathroom, and upstairs walk in closet. the kitchen, entry, and dining room are open to the living room and served by the living room heater. the master bathroom has only an electric radiant mat under the tile floor. our total system approaches 20,000 btu/hr (5750 watts x 3.413 btu/hr/watt), but it is distributed throughout the house and we rarely have all of the units running at the same time. after our first winter, the house stayed extremely comfortable as expected with only a few degrees variation between the warmest and coolest rooms. during our record cold weather this winter (almost 3 weeks with lows dipping into the teens and cloudy snowy skies for much of it) the living room heater struggled a bit to raise the temperature very quickly when setback at night. in hindsight that heater was probably undersized considering that it serves a huge portion of the house – the 2 story living room (with large areas of glass and lots of mass), dining room, kitchen, entry, breezeway, and pantry. we are considering adding a small additional heater to the living room area just for those extreme cases. while many may question our decision to use electric resistance heat and a PV array, for our super low load passivhaus and particular situation it seemed to make sense. overall we are pleased with the system although it is definitely not sophisticated, super efficient, nor great looking. while we don’t have individual data loggers installed yet to track electricity used for heating specifically and to monitor indoor temp and humidity, we will be posting general information about our overall energy consumption this summer documenting our first year of living in the house. hopefully we will begin logging data for year two. we’d love to hear your thoughts, suggestions, corrections, etc. as we continue to ponder appropriate systems for some of our new projects currently in design.